A Little Christmas Faith by Kathryn Freeman is another lovely Christmas read to make you feel all warm inside. Faith has always dreamed of running her own hotel but opening it just before Christmas wasn’t quite what she had planned! She absolutely loves Christmas though and has gone all out to make the hotel as festive as possible. Her parents are coming to stay and her first paying guest has checked in. Adam is tall and very handsome and Faith is immediately attracted to him. Adam however, hates Christmas with a passion to match Faith’s love of Christmas. The book follows Faith and Adam, as well as her sulky niece Chloe, during the days leading up to Christmas. I’ve never really fancied going away for Christmas, though New Year appeals, but after reading this book I could be tempted. Only if I could go to Faith’s lovely hotel and get snowed in though. From worrying about having next to no guests over Christmas, the hotel fills up with a variety of guests due to some unexpectedly heavy snowfall. Living by the sea, we hardly ever get much snow so I always love the idea of being out in the country somewhere with the snow blanketing the ground and preferably with a roaring fire and a whisky to hand. 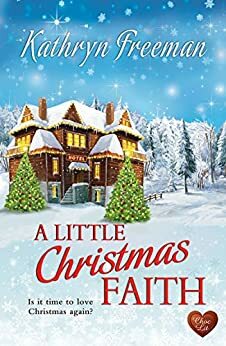 Kathryn Freeman described the scene so well that I could easily picture Faith’s cosy hotel in its picturesque surroundings, with all the Christmas lights twinkling away. She created such a warm, welcoming atmosphere. And talking of warm, the relationship between Faith and Adam certainly saw sparks of attraction flying between them. I could completely see why Faith was drawn to Adam – and him to her – but with neither of them really in a place to start a relationship, it was hard to see how this could progress much beyond a friendship. I had to laugh at poor Adam, someone who hated Christmas, finding himself completely caught up in it albeit rather unwillingly. “How ironic that he’d come here to escape Christmas, and ended up dressed as sodding Father Christmas, surrounded by fairy lights, bells and a herd of flashing reindeer.” Along with Faith, I was very curious to know exactly why Adam hated Christmas so much and my heart went out to him as his story began to be revealed. At the time of writing A Little Christmas Faith is only 99p for Kindle and that is quite a bargain for such an enjoyable read. It’s perfect to curl up with on a chilly winter’s day and dream of snow, romance and handsome heroes! A wonderful Christmas read to warm your heart this festive season. My thanks to Rachel Gilbey at Rachel’s Random Resources for inviting me to review this book for the blogtour. A Little Christmas Faith is published as an ebook by ChocLit UK and you can order your copy by clicking here. Well there will definitely be whisky and I do have my own handsome hero 😉 Lovely book Kathryn and delighted to be part of your tour.